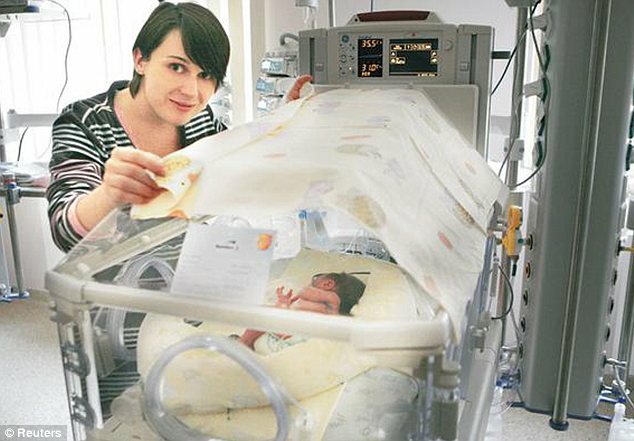 Joanna Krzysztonek, a Polish mother-to-be, lay almost upside down in labor for a staggering 75 days to make sure her twins survived – after another baby she was carrying was born prematurely and died. Joanna Krzysztonek, 31, risked contracting infections that could have caused her to haemorrhage and suffered dizzy spells by lying at a 35 degree angle for more than 10 weeks. The mother-to-be was delighted when she discovered she was expecting triplets. At first the pregnancy proceeded normally and Joanna Krzysztonek continued to go to work. But her joy turned to anguish in December when she went into labor at just 22 weeks and gave birth to one baby who was too premature to survive. Remarkably, doctors at her neo-natal clinic in Wroclaw, Poland, were able to stop her from having the other two by administering medication to ease the contractions. Medics, led by chief obstetrician Mariusz Zimmer, then tied the umbilical cord and put it back inside the uterus. Joanna Krzysztonekeventually gave birth to baby daughter Iga and son Ignacy on February 15, 2012 via Caesarean section. Both names derive from the Roman name Ignatius, which was in turn the name of several early saints. Joanna Krzysztonek’s doctors said they considered her to be in labor from the birth of the first child. “If the first baby was born that means the birth had started,” Dr. Mariusz Zimmer said. Dr. Mariusz Zimmer added that it was Joanna Krzysztonek’s determination and dedication that ultimately saved her babies lives. Human childbirth typically lasts between 8 and 12 hours, while a full-term pregnancy generally lasts around 40 weeks. With help from her awkward positioning and medical attention, Iga and Ignacy’s term inside their mother was 32 weeks. Iga and Ignacy remain in special incubators, but are expected to leave the hospital soon. Joanna Krzysztonek had problems with maintaining her balance at first after leaving her unusual hospital bed but now visits and holds her babies every day.